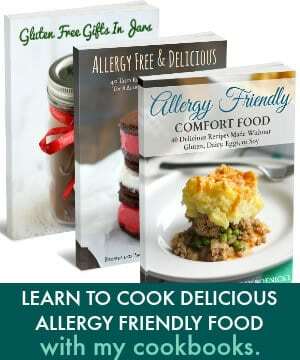 Home » Dairy Free » Cranberry Chocolate Chip Cookies with Walnuts. Cranberry Chocolate Chip Cookies with Walnuts. 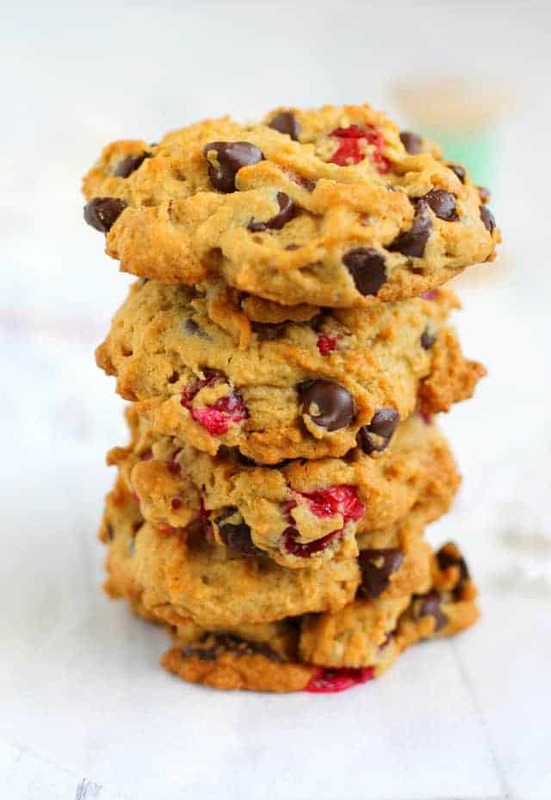 Thick and chewy cranberry chocolate chip cookies are delicious and gluten free. These are just right for a holiday cookie party! I’m sitting here in the dark, with the Christmas tree lights on, and it’s just so cozy and nice. I think that’s my favorite part about Christmas time – you can put Christmas lights anywhere, on anything, and it instantly makes it seem warm and cozy and festive. I’m trying hard to be quieter this Christmas, and enjoy the season rather than feel rushed through it. I have some gigs to play, but I haven’t overbooked myself, I have a good start on my shopping, and I am trying to make sure that we have quality time together as a family rather than running here and there. It’s so frustrating to have way too many things to do and then to wake up on Christmas morning and be an exhausted mess. One thing that we have already made time for is baking. My older son loves to help out in the kitchen, so we’ve been baking up a storm lately! I’m working on a gingerbread recipe that’s coming soon, and we’ve had a lot of fun making gingerbread men and eating them. Now, on to the cookie of the day – these cranberry chocolate chip cookies with walnuts. To be honest, I’ve not done a lot of baking with fresh cranberries. I’ve put them in a crisp, and that was delicious, but I haven’t added them to much else. I decided to throw some into these cranberry chocolate chip cookies, and I was surprised at how much I liked them! They have a bit of tartness to them, but I’ve added a lot of chocolate chips to balance that out. I think my favorite part is the pop of bright pink peeking out here and there. It makes these cookies extra festive. 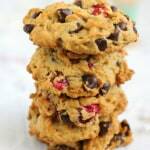 These cranberry chocolate chip cookies are a delicious holiday treat! In a large bowl, mix the vegan buttery spread, applesauce, vanilla, light brown sugar, and granulated sugar. Add the gluten free flour blend, baking soda, baking powder, and salt. Mix until combined. Stir in the cranberries, chocolate chips, and walnuts. Spoon tablespoons of dough onto cookie sheet. Cool on cookie sheet for a few minutes, then transfer to wire racks. Do you do much baking with fresh cranberries? What’s your favorite cranberry recipe? 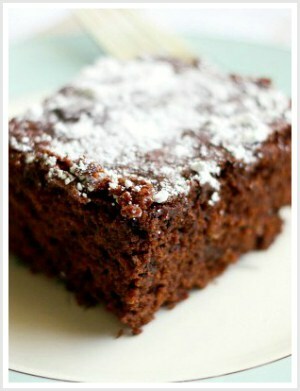 If you’re in need of more baking inspiration, try these gluten free chocolate crinkle cookies. « Vegan Creamy Mushroom Soup. Just made these and they were amazing. I used ordinary flour though, because I’m not GF, but I’m vegan. I think I’m going to keep making these. 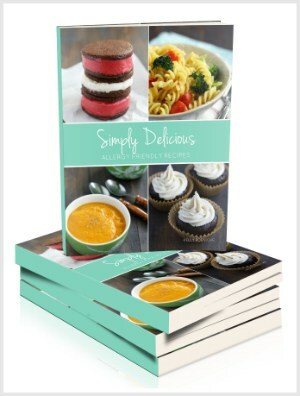 These look great and I love that they are gluten free. Thanks! Love the pop of color from the cranberries! I’ve tried baking cranberry cookies before, but the cranberries came out a bit burnt! I’ll have to try using them for baking again soon! Thanks, Lisa! You should try them again! Sitting by the Christmas tree at night or in the early morning is one of my favorite parts of Christmas! I love how you are trying to slow down a bit this holiday season and just enjoy. We can get so wrapped up in the to do lists, that we forget what’s really important. 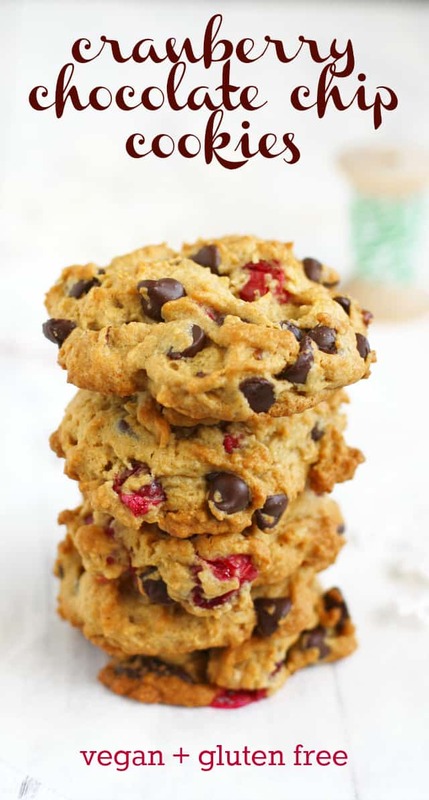 These cookies are just lovely with those bright red cranberries peeking out! Pinned! I made cranberry cookies today- Although I didn’t use chocolate chips because….it may be Summer here and I laid them out for props and they melted. It’s now an ugly chocolate block. 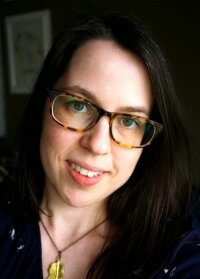 Your photos seriously make me want to faceplant my screen! Such a festive cookie! Love that you combined chocolate chips with cranberries and walnuts. What great texture for a cookie to have! Can’t wait to try these. Yum! I love that you used fresh cranberries! This combination sounds delicious!